Jet d'Eau, literally meaning 'water jet', is the huge Fountain on the Geneva Lake, in the city of Geneva, Switzerland. Jet d'Eau is one of the tallest fountain in the world. Originally, in 1886 they built the fountain to control and release the excess pressure of a hydraulic plant at La Coulouvrenière. Shortly it became remarkable symbol of the city and so it was amplified and relocated to the center of the Lake. The Fountain presence gives the power to the place, every time you look on its majesty you are reminded that you are in the powerful and well organized country. 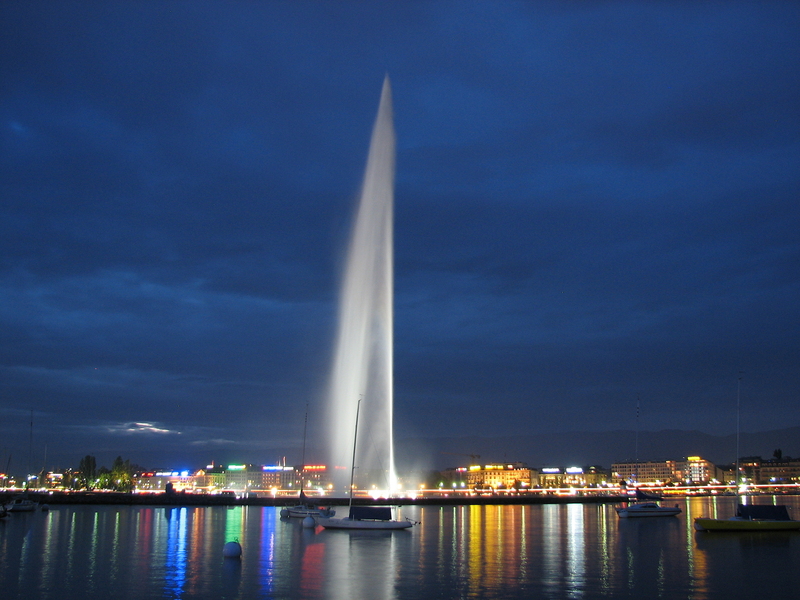 Soon after being finished, the fountain became the symbol of strength, ambition and vitality of Geneva and Switzerland. Its strong engines pump 500 liters of water per second to the height of 140 meters. As water stream can splash the whole public area around the fountain in case of stronger wind, the opening time of Fountain is subject to weather conditions and annual maintenance. To get a taste of the fountain, you can walk the pathway going straight to the fountain and continuing around it and have a great close view, if you don't mind getting a little wet :) Enjoy! Jet d'Eau is basically in the middle of Geneva city, in the very center of happenings. Book Your hotel around here, at the lakeside area, to have a views of a lifetime and enjoy the fresh air coming from the lake.